Reasons for concern: This plant has allelopathic (toxic) properties that inhibit the growth and development of neighboring plants, leading to a monoculture. It produces a huge amount of pollen in the fall, afflicting millions of people who have allergies. Leaves: Finely divided. Up to 6 inches long and 4 inches across. Young leaves blue-green and hairy. Mature leaves hairless. Stem(s): Erect. Many branched. Greatly varied in size, up to 3 to 4 feet tall. Green to light pinkish red. Sometimes blue-green. Upper stems end in one or more spikes of flowers. Flowers: Numerous, small, inconspicuous flowers, initially green. Later turn yellowish-green or brown as they go to seed. Male flowers produce fine, wind-carried pollen, spread in late summer or early fall. There are male and female flowers in clusters on ends of branches, with male flowers found above female flowers. Gravity aids fertilization. Flowering occurs in August through September. Seeds: Numerous. Seeds mature by October. Roots: Extensive root system. Fibrous. Native to: United States, except Alaska and Hawaii, Canada and northern Mexico. Where it grows: In full sun with average to dry conditions from 5,200 to 8,000 elevation. Along ditches, in waste areas, and other disturbed areas, and areas along roadsides and railroads. In gardens and lawns. In many soil types, including high amounts of clay, gravel or sand, and in sterile soil. 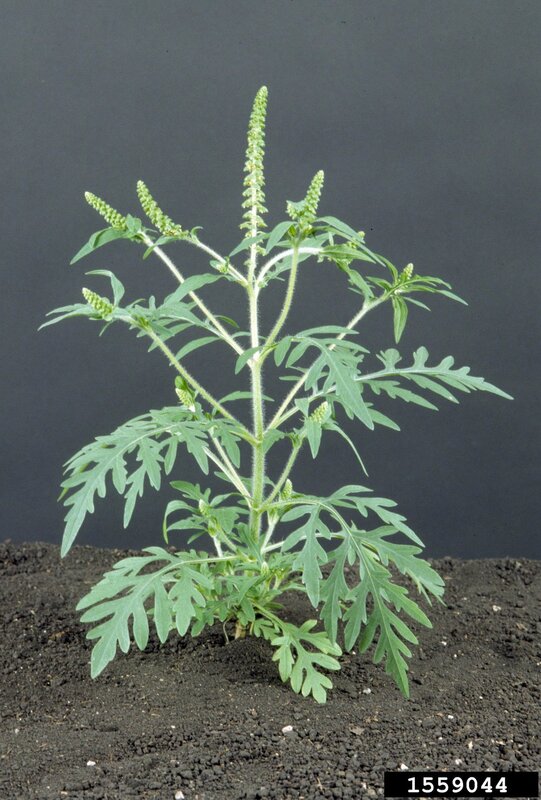 Weedy characteristics: Ragweed produces numerous seeds, which remain viable for 5 years or much more. These seeds are easily dispersed by wind, water, and birds, burrowing animals, and humans. It is resistant to drought and grows in many soil types and under adverse conditions. It has allelopathic (poisonous) properties that inhibit growth and development of nearby plants. Repeatedly monitor previous infestations for new growth. 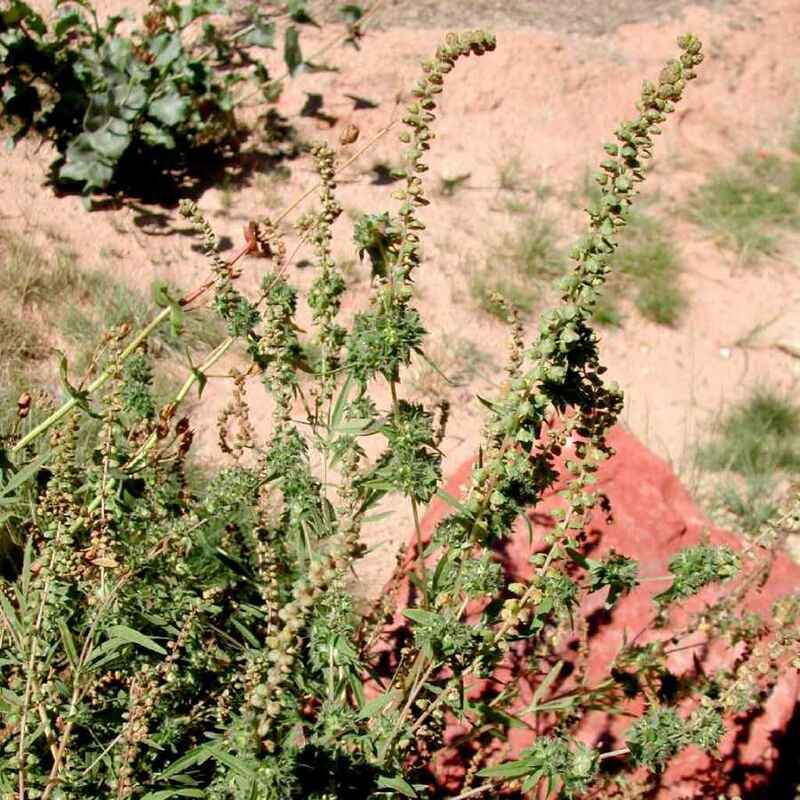 Look-alike native plants: There are several different species of native ragweed (Ambrosia spp.) in northern Arizona which look similar to each other. They all share the same weedy characteristics, reasons for concern, and control strategies. Control strategies: Hand-pull before plants flower or go to seed, release pollen, and spread seeds in late summer. It is easy to pull. Bag any buds, flowers or seeds. Heavy mulches can greatly reduce growth. Mowing is ineffective. Repeatedly monitor previous infestations for new growth. Plant desirable native species to outcompete invasives.